Cheryl at Gluten-Free Goodness adopted Gluten-Free Bay and whipped up her Toasted Quinoa Pilaf recipe. 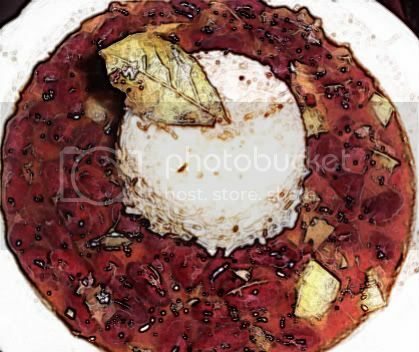 As she noted in her post, Gluten-Free Bay features many traditional Jewish recipes made gluten-free and highlights other recipes that are free of other dietary allergens. 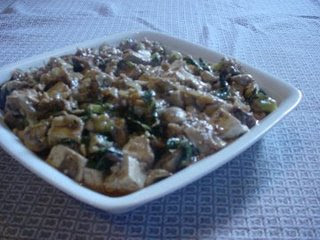 Here in the Wheat-Free, Meat-Free test kitchen, I adopted Fresh Ginger and blogged about her wonderful Thai stir-fry, Lard Nah, using collards, mushrooms and tofu bathed in a delectable sauce. Fresh Ginger features lots of garden-fresh produce used in a multitude of international cuisines and offers lots of appetizer and cocktail recipes. The impressive baking skills of Sheltie Girl at Gluten A Go Go were put to work in her adoption of Naomi at Straight Into Bed Cakefree and Dried. 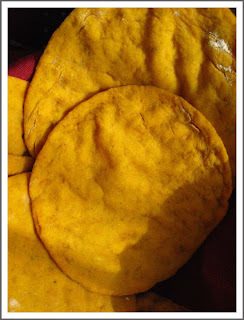 She tried two version's of Naomi's Sweet Potato Pita (also spelled Pitta) Breads and they look absolutely wonderful. She tried them out with several different sandwich fillings. Carrie at Ginger Lemon Girl adopted The Good Eatah, whose great gluten and dairy-free blog had a German Chocolate Brownie Recipe that looks like it won't last long in any house. The Good Eatah (that's "Eater" translated with a Massachusetts accent) also has lots of portraits of one of the world's most endearing-looking dogs, Henry, so be sure to check it out. The Ginger Lemon Girl was adopted herself by Terri over at Faking It Gluten Free Style, who tempted us all with Cheddar Garlic Biscuits a la Red Lobster. Terri was fabulous enough to put together a glamorous seafood dinner to adorn these glorious biscuits. (Is that nail polish on the end of those crab legs?) It looked so tasty that I was inspired myself to make up a batch a few days ago. 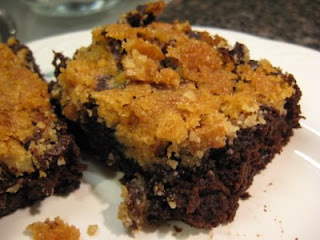 They are awesomely good and didn't last long on our supper table. 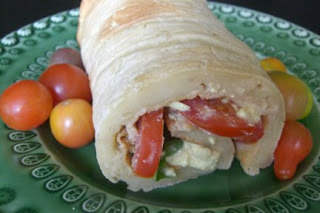 Despite all her graduate student demands, our Adopt a Gluten Free Blogger founder, Sea at the Book of Yum, found time to eat and blog with a Gluten-Free Sandwich Wrap from Kate at Gluten-Free Gobsmacked. This looks like a keeper recipe! Lynn from the new blog, Gluten-Free Gastronaut, adopted Bea at La Tartine Gourmande, the French-born food stylist, photographer and writer. You'll find gorgeous photography at Bea's site, travel writing, and of course, wonderful recipes, at least one hundred of which are gluten-free, as noted in her categories list. 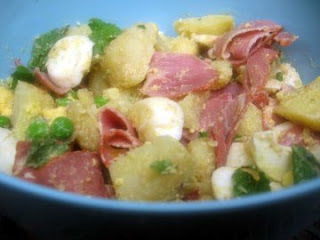 Lynn made a delicious Potato Salad with Peas and Mint, just perfect for springtime munching. Naomi the Accidental Vegetarian adopted Shauna, the Gluten-Free Girl and veganized her Cajun Red Beans and Rice recipe. And how about this awesome photo! 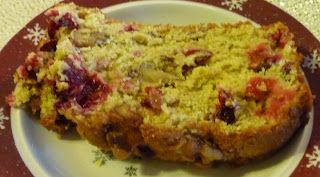 Thomas at the Gluten-Free,Casein-Free Diet Experience adopted Natalie, the Gluten Free Mommy and made her delicious-looking Cranberry Nut Bread. Thomas notes that Natalie's recipes are always tasty and family-friendly and I am looking forward to his roundup next month when he hosts Round 4 of the Adopt A Gluten-Free Blogger, from May 26 - June 9. Thank you to all the bloggers who participated during this busy garden-starting/school/wedding/graduation/Mother's Day time-of-the-year. I send a big hug across the country to Sea at the Book of Yum for coming up with this great way for all of us gluten-free cooks to connect. Looking forward to Round 4 already! I loved reading the round-up; I'll definately me making a lot of those recipes. I'll have to join in on the next adopt a blogger. Awesome job! Rachel - This is a fabulous round up. Thank you so much for hosting the Adopt A Gluten Free Blogger this month. There are so many wonderful foods to try with all the different gluten free bloggers.